I love seeing ideas I haven't encountered before! Susie combines first names of two famous people from a certain walk of life to form a third. I'm a big bball fan, so that made the discovery of BILL Walton + RUSSELL Westbrook = BILL RUSSELL even more interesting. I appreciated that Susie drew from four different professions. 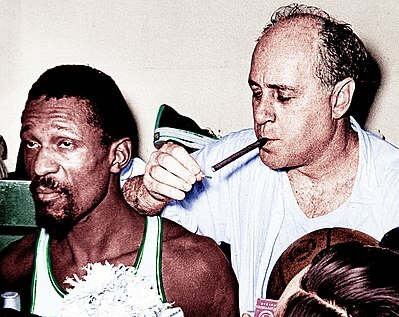 Jim (Horne) isn't a hoops fan, so the great BILL RUSSELL didn't do anything for him (blasphemy! ), but he recognized the others easily. I am only vaguely familiar with JAMES TAYLOR, but the other three came like a flash. It's usually impossible to please every solver out there, so at least giving something for everyone is a smart approach. Susie usually has such solid gridwork. This wasn't my favorite of her early-week grids, though. The GOYA / ARYAN crossing is possibly tough for newb solvers. Along with ANON RTE ETAT ABABA SLO, it's passable, but I have a high bar for her. I also would have liked a little more bonus fill. BOX KITE was fun, but what else? I'd be curious to see what happens if you take out the black square between UNDO and RELY. I know, that makes the NW corner tougher, but I think it's possible to still keep clean. Interesting enough idea that I considered it for the POW! Probably would have gotten it if at least one of the themers had been a woman – MEG RYAN = MEG Tilly + RYAN Gosling? – or if the gridwork had been as stellar as Susie's stuff usually is.